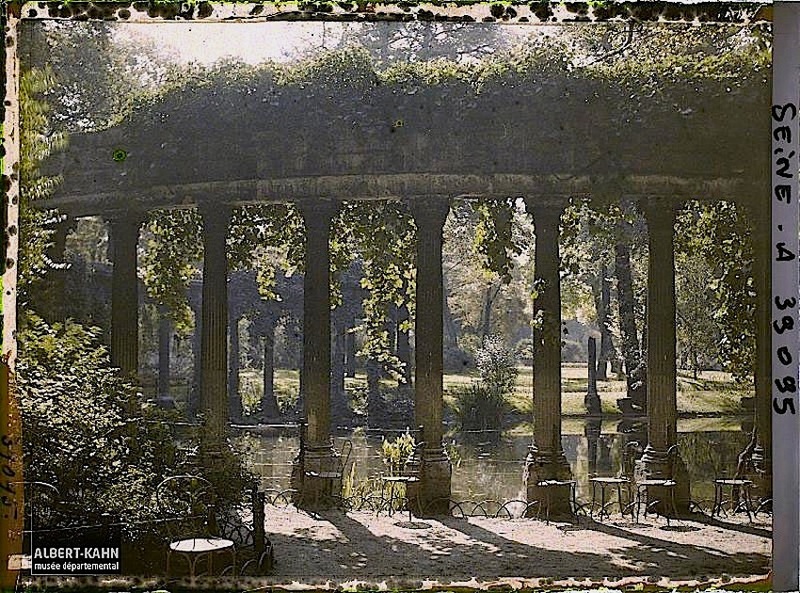 La Naumachie Colonnade in Parc Monceau, Paris, September 12, 1923, by Auguste Léon, via Archives of the Planet Collection – Albert Kahn Museum /Département des Hauts-de-Seine (both photos). In Ancient Rome, a naumachia was a large basin dug for staging naval battles* as public entertainment. In Parc Monceau, La Naumachie is a tranquil oval pool framed on one end by a Corinthian colonnade. The columns were once part of a never-completed late 16th century mausoleum attached to the Basilica of Saint Denis. In the late 1770s, they were acquired by the Duke of Chartres for an elaborate “Anglo-Chinese” public garden he was creating in northwest Paris. He filled it with architectural follies (see here) — one of them being a “Roman” colonnade. The Duke was guillotined in 1793. His land was first confiscated and then returned to his heirs, who sold about half of it to developers. 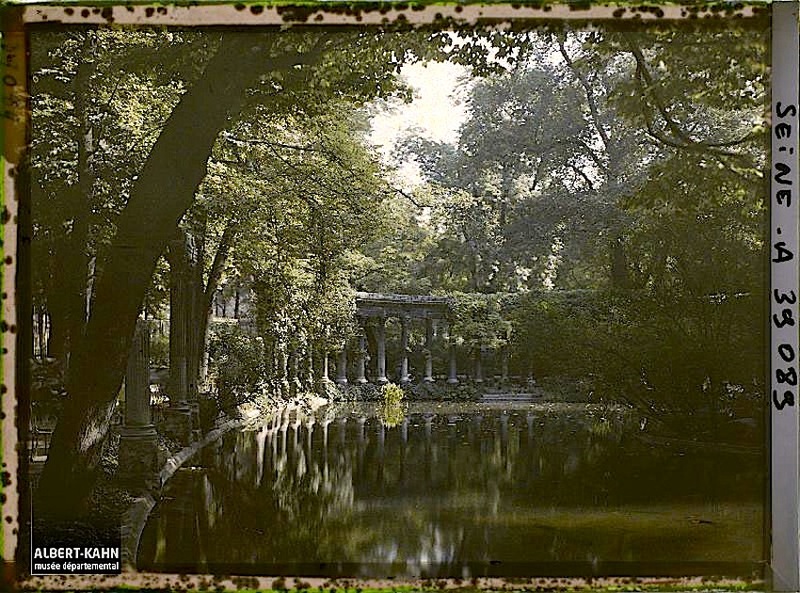 In the 1850s, the city bought the last 20 acres of the old garden, and Parc Monceau opened in 1861 as a largely informal “English-style” park. Today, there are still a few follies, although only the colonnade/naumachia and a small Egyptian pyramid remain from the 18th century. The autochromes above are two of about seventy-two thousand that were commissioned and then archived by Albert Kahn, a wealthy French banker, between 1909 and 1931. Kahn sent thirteen photographers and filmmakers to fifty countries “to fix, once and for all, aspects, practices, and modes of human activity whose fatal disappearance is no longer ‘a matter of time. '”† The resulting collection is called Archives de la Planète and now resides in its own museum at Kahn’s old suburban estate at Boulogne-Billancourt, just west of Paris. Since June 2016, the archive has also been available for viewing online here. *The word also refers to the spectacle itself. †words of Albert Kahn, 1912. Also, the above photos (A 39 095 S and A 39 089) are © Collection Archives de la Planète – Musée Albert-Kahn and used under its terms, here.